When Chris McMasters left his former job as vice president/chief information officer at Honeyville, Inc. to become Corona, Calif.’s chief information officer in April 2016, he was surprised at how little the city relied upon data to make its decisions. As a result of McMasters’s efforts and work with Harvard University, the Center for Government Excellence at Johns Hopkins University (GovEx) and Bloomberg Philanthropies through its What Works Cities initiative, Corona now relies on data to carry out a number of processes. 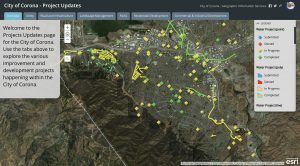 The city launched an open data portal in July 2018 that displays a variety of data visualizations for the public to view. Data used in this format — cleaned up, aggregated from multiple sources and presented as open data in a centralized location — can be valuable to the public as well as internally. On one hand, publishing open data like budget allocation charts or a GIS map of pothole filling progress can be a pragmatic citizen engagement tool. 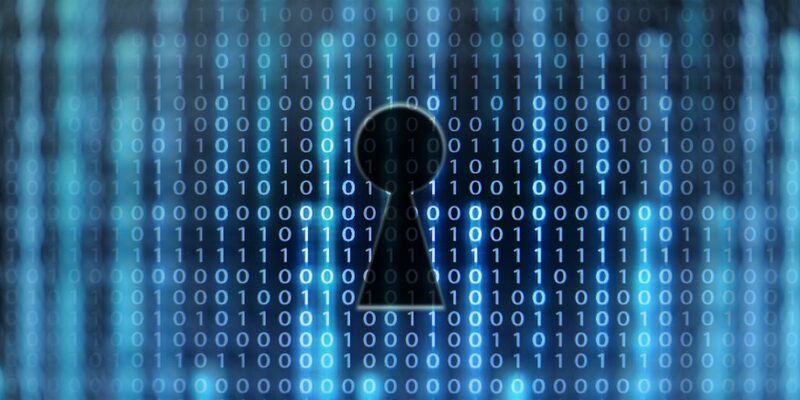 “I think that government leaders are starting to see [open data] more as a necessity for the work that they do and for improving public trust or improving trust in the government… and also as just sort of an opportunity for a different way of engaging with their constituencies than perhaps has ever happened before,” says Andrew Nicklin, director of data practices at GovEx. At the same time, that data can also be used internally in a much more efficient manner than agencies would have previously been able to do. However, large-scale changes must be implemented before open data can truly serve a government and its people well. There’s a learning curve involved, too, as what we today consider open data is a far cry from how governments practiced it as recently as earlier this decade. This approach can provide value to informed researchers, but when most people encounter data, they don’t know what they want to know. So, during this period, open data appeared to have a question mark hanging around its utility beyond simply posting it online, Balch says. Over the past couple of years however, governments have begun to pull business operations like budgeting and performance management around open data. Open data provides the public side of budget and performance processes to help governments communicate with the public, Balch says. 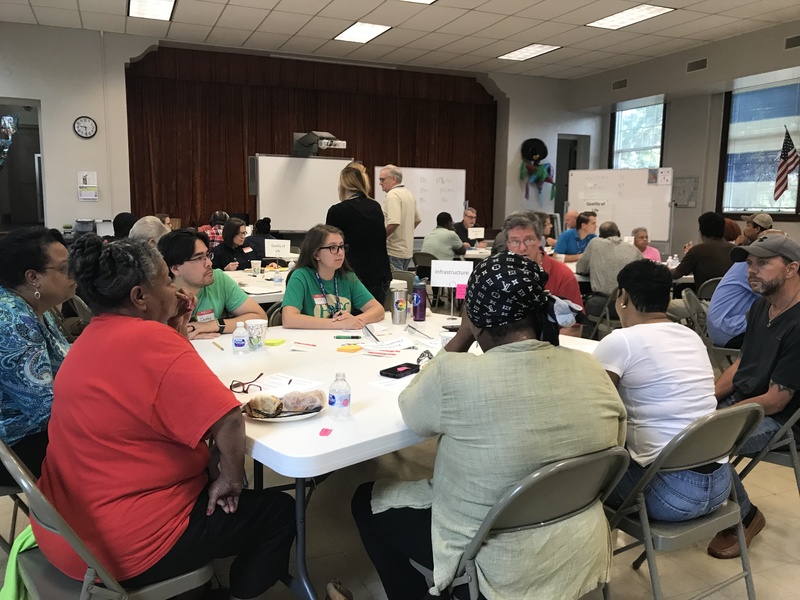 Giving the public a window into the strategic goals that shape the budget and the outcomes that the budget delivers to the community improves the communication between the public and its government. Shark agrees, saying that going through the trouble of publishing data should not be an end unto itself. While open data serves a purpose in promoting transparency and giving the public open data, “the real move, to me, is data-driven decision-making,” he says. This desire for data-driven decision-making was what initially inspired Corona to begin building its data initiatives. 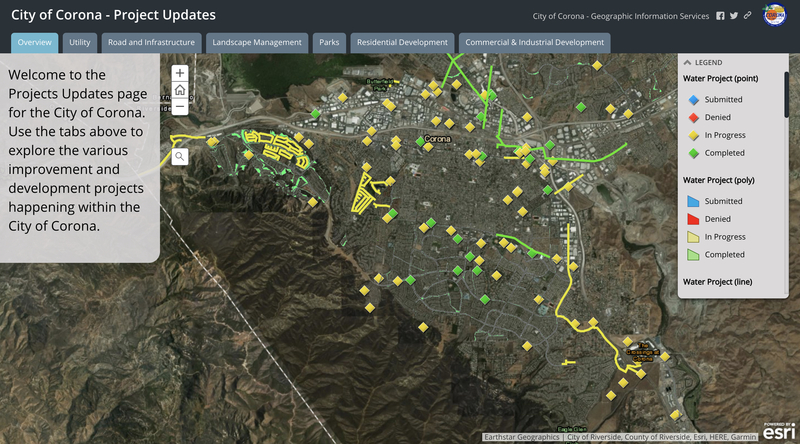 A screen shot of Corona, Calif.’s ArcGIS map showing improvement and development projects happening around the city. “When the [Corona] city manager hired me to come in, his whole concept and vision was, ‘I want to make a data-driven city, and I want it to be open and engaging.’ So, that was sort of my marching orders,” McMasters recalls about starting as Corona’s CIO. At the time, McMasters found a city with firm silos in place. He likened the situation to each department being its own business — public works, police, economic development departments have their own challenges, directives and software. Thus, a major challenge for Corona became pulling multiple data sets from its disparate sources and aggregating it together to be able to make data-driven decisions. To GovEx’s Nicklin, breaking down silos is immensely important for creating good data policy. GovEx advocates using a single data portal to serve citizens. Not only does this create a one-stop shop for citizens interested in data, it also allows governments to combine data from different departments, which in turns fosters the notion of data as a strategic asset. That’s precisely how Corona worked to solve its silos conundrum. City staff went into the Corona government’s application programming interfaces (APIs) to tap into the various data sets across the municipal government. McMasters says. Staff then pulled that data into cloud-based databases and ultimately created a “data lake,” or a single location to which all the data flowed. Even with physical and digital silos removed, changing the culture of data sharing remains an important item to accomplish. Changing a culture that has long existed in local governments across the country however, comes with its own issues. In 2016, Little Rock, Ark. — The Natural State’s capital and largest city —also became the first Arkansas municipality to launch an open data portal. 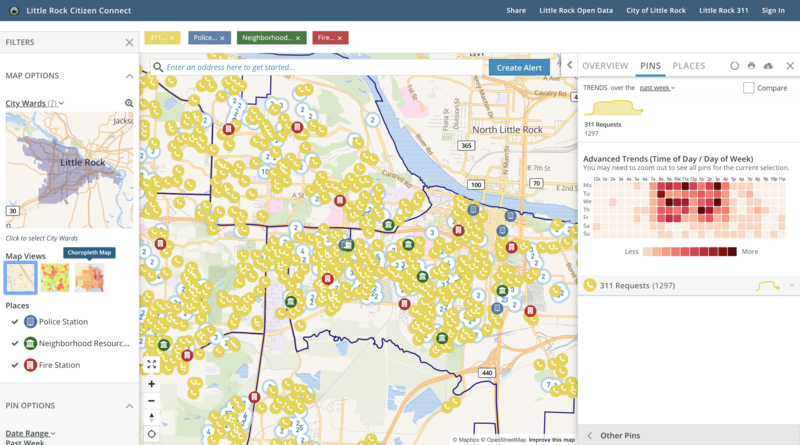 A screen shot of Little Rock, Ark.’s Citizen Connect platform. The beginnings of that portal lie in 2014, when Little Rock’s IT director purchased an open data platform to spur data transparency with the public as well as between city departments, according to Little Rock, Ark. Performance and Innovation Coordinator Melissa Bridges. The IT director worked with a city IT staff member to quietly set up a data site and began working with different city departments to figure out information to pull onto the site, Bridges says. However, the city lacked a governance structure to unify the effort across departments. Little Rock was selected in late 2015 to participate in the What Works Cities initiative, according to a city news release. Throughout most of 2016 as the city involved itself in the What Works Cities initiative, Bridges and her staff worked with department heads to get them to buy into the concept of collaborating on data, explaining why it was important and how it could benefit department staff in doing their jobs. Another component of this work involved explaining the importance of determining standards for working with data and then codifying those standards into procedures and policies, she says. However, Bridges and her staff later realized that day-to-day data and information handlers — who work below department heads — had no idea about the city’s open data portal or about the What Works Cities initiative, she says. Her staff soon realized that city departments lacked data coordinators within individual departments who did day-to-day work with data. Over the past year, Bridges and her staff have worked with those employees in a few ways, she says. They engaged with individual data owners, educating them on data standardization. City staff also worked with trainers at open data platform Socrata to hold “data academies” with groups of Little Rock employees to educate them on the importance of the city’s data work. Bridges also brought outside stakeholders into the data academies to provide a different perspective on the conversation. Additionally, Bridges and her staff began conducting ongoing hourlong trainings where city staff are given a cursory walkthrough of Little Rock’s open data portal and its other data initiatives and then encouraged to click through the city’s online data resources, she says. The public however, is also an important group to engage about open data. Little Rock promotes its open data practices through social media, news releases when the city pushes out a new data set, access on the app NextDoor and engaging with community associations and organizations, Bridges says. “You name it, I think we’ve tried it,” she adds with a laugh. It takes a lot to engage and educate people on data — especially when part of that education is making them aware of its existence and its usefulness. For McMasters, constructing a story around data, or building data narratives, is immensely important to showing its importance. Little Rock, Ark. promotes its open data projects through methods including social media, news releases and community presentations/discussions. Corona accomplishes this by breaking data sets down into subsections related to the city’s strategic plan, such as safety, finance or economic development, he says. These areas serve as focal points, and relevant data is organized within those subsections to show how the city makes decisions and how citizens can evaluate the government. A major pitfall that governments can encounter is feeling that their data needs to be 100 percent perfect before releasing it, Nicklin says. However, he notes his satisfaction in seeing that more and more governments are releasing data while acknowledging that it contains errors and omissions. “Rather than getting defensive about it, it’s actually a proactive stance of, yeah, our data is messy, and our data is not perfect, and if you’re going to work with it, that’s something you’re going to have to accommodate,” he says. 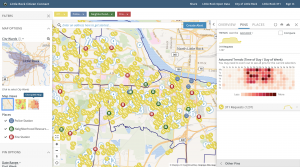 When Little Rock launched its Citizen Connect platform in 2017 as an online citizen engagement tool, the city only had 311 and police information uploaded to the platform, Bridges says. City staff knew that those data sets were relatively clean, they were already in the Little Rock open data portal, and city staff had processes in place to keep them updated. Over time, Little Rock added in three more data sets after either departments or residents requested the additions. “I think anybody that does this work will tell you it’s all about iteration,” Bridges says. Like most forms of technological innovation, open data is an evolving practice. Changes in work culture and technology can be frustrating both because they are tough to carry out and because they are dynamic. However, it’s important to keep charging forward.